Liverpool midfielder Jordan Henderson has jumped to the defense of club captain Steven Gerrard following another disappointing result for the Reds. Gerrard’s influence on the pitch has been questioned this season following the departure of talisman Luis Suarez during the summer transfer window, but Henderson is convinced that the 34 year old remains one of the most influential players in the Premier League. Gerrard found himself on the scoresheet yet again during this weekend’s Merseyside derby, but the Reds saw a late Phil Jagielka stunner rob the hosts of two points. The result means that Brendan Rodgers’ side have now dropped eight Premier League points during the month of September following back to back defeats against Aston Villa and West Ham United prior to the draw with Everton. 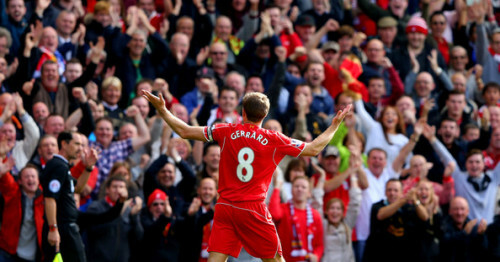 Henderson, meanwhile, is convinced that Gerrard can help lift Liverpool back up the table. The Reds are now in 13th place in the league, with just seven points from their opening six matches. Brendan Rodgers’ side have been struggling in front of net this season, finding the back of the net just eight times this season, while conceding nine times. Despite their domestic troubles, the Reds will be looking forward to reigniting their Champions League record on Wednesday night when they travel to FC Basel before welcoming West Brom to Anfield on Saturday. Liverpool midfielder Jordan Henderson has jumped to the defense of club captain Steven Gerrard following another disappointing result for the Reds. The webs newest soccer blog, looking for readers and contributors.